Got a problem with your Instagram account? You’re in luck. Instagram support is only a few clicks away. The Instagram Help Center is on hand 24 hours, seven days a week at help.instagram.com. There are tons of topics and categories for help, and chances are your issue will be covered. So what kind of Instagram support can you expect? We’re breaking down the types of things the platform’s help center teaches you how to navigate. The “Using Instagram” category will cover the basics of getting started and navigating your Instagram journey. Unsure about how to get your profile going? This category covers the basics of beginning on Instagram. Among the issues covered here? So if you’re having issues with any of these first steps, consult Instagram Help Center to get them straightened out. So if you’re trying to go back and edit the caption on your post, but having problems visit this section. Hoping to tag your BFF but having trouble? Consult with the help listed here. So if you’re having problems adding in the perfect bio or can’t decide whether or not to go public or private, here’s the place to read up. So you’ve got your Instagram profile up and running. You have loyal followers, you’re posting away and you are loving the social media platform. But what if you have a question about how to run your newfound account? This section is perfect if you need Instagram support on the ins and outs of running your profile. This will help you figure out how to go private if you so decide, or how to delete your account if you’re unhappy with your social media presence. Adding accounts is another option that sometimes tricky to do. Instagram support in this area is under this category, showing you step-by-step how to link your personal, business or extra Instagram accounts in the app. Sometimes you just need a little help logging on to Instagram. For those times, it’s this category that will help you figure things out. There’s a section for those having trouble logging in. Whether your issue is password related, you forgot your username or your account has potentially been disabled, it’s all covered here. If you have done all those things and the issue persists, it’s a bug. There’s a place to report it within the Instagram help center and get the Instagram team on the case. Social media can be a dangerous place. For that reason, there are community guidelines for Instagram that can be found in this section. One option to keep yourself safe on Instagram? Go private. By going private, you ensure that you’re aware of everyone following your account. This way you can keep strangers (and potential predators) out. You can feel safe adding a location or posting personal photos if you know exactly who will see them. Public accounts, though more inviting, don’t offer you this luxury. You never know who might be perusing your Instagram profile. There are times when conflicts can arise on Instagram. Though it sounds strange, it’s very easy for a photo or comment to result in a fight — whether it be with a stranger or a friend. For this reason, it’s smart to think before you comment, according to Instagram support. They suggest you “ask yourself, ‘is this worth it? '” before fanning the flames of an Instagram scuffle. Often times, it won’t be and it’s best to stay out of it. But what do you do if people are harassing you on the site? If you receive any “unwanted communication” the Instagram Help Center advises you to block that person. Blocking online bullies is a great and effective way to keep yourself safe on social media. When you block them, you’re ensuring that they’re no longer able to see your profile. If you ever change your mind, there is the option to unblock people as well. This category contains tons more information. There is guidance on how to report something, information for law enforcement and more. There are also tips on sharing photos safely and information on eating disorders, since that’s an issue near and dear to Instagram. You may never need this category. But if you own a business, chances are you’ll want a social media presence. All of these subcategories provide useful information for those navigating the world of Instagram for businesses. 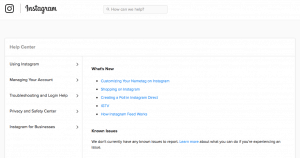 If you’re having an issue with Instagram, chances are it’s covered in the Instagram Help Center. Receive Instagram support by perusing the categories, and your issue will likely be resolved quickly.